If you have created a window using Glade and want to display this window on your Python program containing the event handlers of the Window, then you should follow this tutorial. This small code will load the Glade file and displays the window. Note : The Glade Project file format should be GtkBuilder. The first yellow backgrounded text has the name of the GLADE file. The second yellow backgrounded text has the name of the GLADE Window. Normally It would be window1. 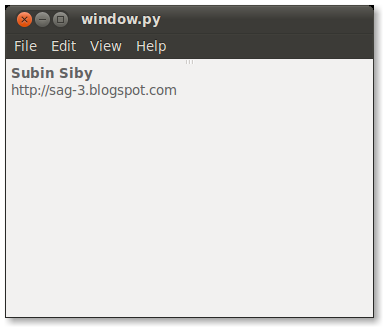 So, Now you know how to import a GLADE file in Python and display the window. If you have any problems/suggestions/feedback just say it out in the comment box below.